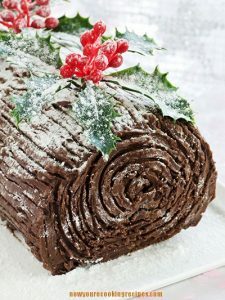 I would always make this yule log for New Year’s Day dinner. 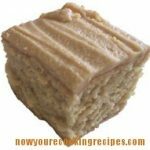 The recipe is long, but it’s easy to make and looks very impressive. Oh, and it tastes good too! Preheat oven to 350 degrees F. Grease a 15 x 10 inch jelly roll pan, and line with waxed paper. Grease waxed paper. Mix flour, soda, and salt together. Beat eggs in a small mixer bowl at high speed, until thick and light - about 5 minutes. Gradually add the sugar, and beat until thick. Melt the chocolate and water together, and add to the egg mixture. Fold in the dry ingredients, and mix gently but thoroughly. Spread in prepared pan, and bake for 15 - 17 minutes, until the cake springs back when lightly touched. Remove from oven and turn out immediately onto a tea towel that has been sprinkled generously with !icing sugar. Remove waxed paper, and trim of any crisp edges of the cake. Begin at the narrow end, and roll up the cake and the tea towel together. Allow to cool. Whip cream until soft peaks form. Stir in icing sugar and vanilla and whip until stiff. Unroll the cake when cool, and spread the top with the whip cream. Soften butter. Combine all ingredients and beat until smooth and of good spreading consistency. Use the centres of the ends you sliced off the cake to make "bumps on the log": Use a little of the icing to affix the bump to the side of the cake - one on each side. Ice the entire cake with the icing, including the ends and the bumps. Run a fork along the icing so that it resembles tree bark. Sprinkle with icing sugar, and decorate with holly or other Christmas decoration leaves. What do you mean by 3 chocolate squares? Do you know how many oz or grams it weighs? A square of chocolate is equal to 1 oz or 28 grams. I’ve made two Yule logs. When I tried to roll them they bake. I haven’t tried your recipe. I hope it doesn’t break when I roll it. I make sure it is still hot. I’ve rolled pumpkin rolls and this didn’t happen. Mine broke, too, but I was able to bind it back together with frosting. This was my first ever attempt at a buche de Noel, and this recipe was simpler than most. I love the recipe, simple and easy.